The Libyan capital Tripoli on Friday was girding for a potentially major armed conflict pitting the country’s two major military alliances against each other as international officials sought to stave off the battle. Forces allied to Khalifa Haftar, the self-declared Field Marshal of the eastern-based Libyan National Army, amassed troops in what appeared to brand new military vehicles likely shipped from the United Arab Emirates south of the city near Gharyan, and ordered his forces to take Tripoli. “The battle is coming,” Mr Haftar’s spokesman Gen Ahmed al-Mismari declared on Thursday. An alliance of armed groups protecting the city, loyal to a rival government as well as the UN-backed authority, mobilised at Tripoli’s entrances and prepared for war as forces from the powerful central Libyan city of Misrata flooded in on pick-up trucks mounted with machine guns to bolster the capital’s defences against a man many see as a military strongman. The Tripoli-based groups rejected the idea of a military leader taking the city. “Libya will only be a civil state,” the Tripoli Protection Force was quoted as saying. Officials across the world scrambled to avert yet another round of armed conflict in the Mediterranean coast city of 1.2 million, which has been a battlefield for rival militias for years. UN Secretary-General Antonio Guterres was to meet Mr Hafar in Libya on Friday, a day after meeting Fayez Serraj, the internationally recognised prime minister, in Tripoli. The UK called for an emergency meeting of the UN Security Council on Friday. A statement issued by the UK, US, France, Italy, and the UAE cited concerns about the fighting and called for a de-escalation, but did not identify any belligerents. “At this sensitive moment in Libya’s transition, military posturing and threats of unilateral action only risk propelling Libya back toward chaos,” said the statement. It remained unclear whether any clashes had yet begun. So far Mr Haftar’s forces managed to negotiate the handover or declaration of neutrality of towns on Tripoli’s outskirts. Reports from Tripoli and photographs posted to social media also suggested that dozens of his men had surrendered to the Tripoli militias. Libya splintered into squabbling, armed factions following the NATO-backed uprising that toppled longtime ruler Muammer Gaddafi’s regime in 2011. An armed force led by Mr Haftar and a government based in the east now vies for power with a government backed by a collection of militias in the country’s west. Mr Haftar, 70, a one-time army officer loyal to Gaddafi, spent years in exile in the US state of Virginia before returning and eventually declaring war on the country’s interim authorities in 2014. His sudden decision to make a lunge for the capital comes ahead of 14 April peace talks brokered by UN envoy Ghassan Salame, in the Western city of Ghadames, Libya. But many wonder whether some countries are playing a duplicitous double game on Libya. Russia, for example, staunchly backs Mr Haftar as a force that opposes Islamism, but claims to support the UN-backed authority of Mr Serraj. On Thursday a leading Russian lawmaker praised Mr Haftar. 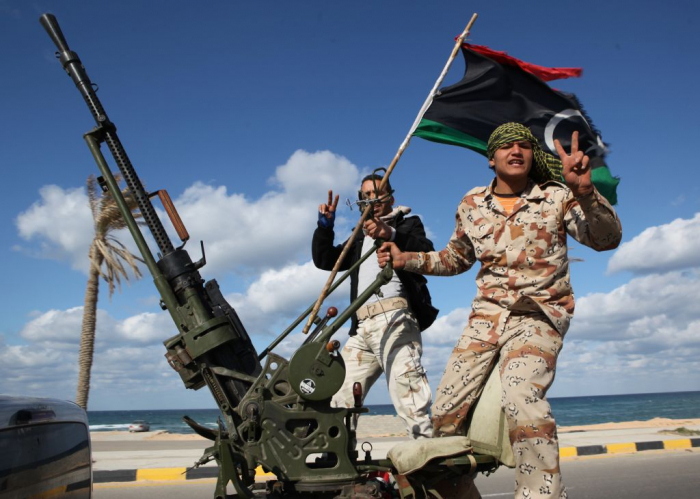 "If his troops bring order to Libya, stop the activities of bandit groups in the country, which terrorise the people, it will be good,” Vladimir Dzhabarov, deputy chair of the foreign policy committee of the parliament’s upper house, was quoted as saying by the Interfax news agency. Despite co-signing the UK’s statement, US Secretary of State Mike Pompeo was tepid when asked about Mr Haftar’s declaration of war on the capital. “We’ve been following the UN process, trying to do the best we can to be a positive force to deliver a good solution for the people of Libya and increase stability there,” he told reporters on Thursday. Both the UAE and Egypt, which also condemned the escalation, have strongly backed Mr Haftar with weapons and military support, including airstrikes targeting the forces of the western Libyan militias. The UAE operates the al-Khadem airbase, where many of Mr Haftar’s new weapons have been delivered. Turkey and Qatar both publicly back the UN peace process but have been accused of supporting the Islamist-leaning Western alliances of militias. Though France has invested in the UN-backed peace process, it has also been cooperating militarily with Mr Haftar in the east. French defence minister Jacques Yves Le Drian visited both Mr Serraj and Mr Haftar last month. “The international community is asking for a political solution whilst refusing to hold back Haftar,” said Anas el-Gomati, director of the Sadeq Institute, a think tank. Mr Haftar’s offensive and the escalation comes just weeks after a hopeful moment, when Mr Serraj and Mr Haftar met in Abu Dhabi to hammer out an agreement. Insiders say the meeting ended far more grimly than described, with both men refusing to shake hands. Mr Gomati said Mr Haftar had insisted on a political formula that Mr Serraj had rejected, setting the stage for the current confrontation. Mr Haftar may have also seen an opportunity to take the capital amid ongoing regional uncertainty. Algeria, a powerful guarantor of North African stability, is undergoing massive political convulsions following the resignation of its longtime president Abdelaziz Bouteflika. And Turkey, a patron of the Tripoli government, has been consumed by the result of municipal elections that have turned its gaze inward. Mr Haftar is considered a toxic, polarising figure by many Libyans, who sometimes see him as the kind of imposing strongman represented by Gaddafi. Mr Haftar’s war to to take the eastern city of Benghazi stretched for three years and destroyed much of the city. Winning Tripoli back, especially if the Misurata militias come to the capital’s aid, will likely take longer and be bloodier, but he may calculate that he will be victorious in the long run.